Firstly, on behalf of the President, Chairman and members of the Executive Council, I would like to express our sincere sympathy and condolences to all the victims and their families who have suffered as a result of the recent evil murderous attack on innocent police officers and civilians in London. Particular recognition should be made of the selfless acts of assistance given to the injured on Westminster Bridge and the Palace of Westminster, not only by the actions of the emergency services but the immediate first-aid afforded to the injured by fellow members of the public. The Metropolitan Police have now stated that the killer of pedestrians on Tower Bridge, and later PC Palmer, Khalid Masood had no links to any known terrorist organisation and had not, as had been alleged in some newspapers, been radicalised while serving a prison sentence in 2003. Khalid Masood was nothing more than a misfit, a criminal with a history of violence, and a drug taker. The day before, a notorious terrorist died from an illness – Mr Martin McGuinness, a long-time mass murderer, senior member of the IRA and latterly a politician. As we all know by now, the murdered police officer, Police Constable Keith Palmer, was unarmed when on duty at the Carriage Gates which afford vehicle and pedestrian access to New Palace Yard at the Houses of Parliament in Westminster Palace. It transpires that his killer ran straight past the open gates and, when confronted by PC Palmer, a scuffle ensued whereupon the police officer was repeatedly stabbed under the arm and in the neck. Apparently, a few seconds later, Masood was then confronted by two plainclothes police officers who had allegedly been assigned to protect Sir Michael Fallon MP, the Defence Secretary (he was in the Commons at the time). They fired three shots at Masood, whereupon he fell to the ground and was treated by paramedics for his wounds. He died later in hospital. It is believed that the murderer was in possession of two long knives and that he had a history of violence and had been a bodybuilder – he would most certainly have presented a frightening and alarming presence, particularly in his agitated and frenzied state. In the aftermath of this horrific incident and appalling loss of innocent lives, it is only right that questions have been raised as to how this murderous individual was permitted to gain access to the Mother of Democracies – Parliament – and why the police officers posted on the Carriage Gates were unarmed when this country’s security awareness level is still at ‘Severe’ (which indicates that a terrorist attack is highly likely). What has become clear is that the reason the gates were left open was to placate some Members of Parliament, who did not wish there to be an armed police presence at the entrance to the Houses of Parliament. One wonders if this was a result of the ‘Plebgate Incident’ involving access to Downing Street – which, incidentally, does have armed guards with automatic weapons, the gates are closed and there is a steal ramp to prevent a terrorist or rogue vehicle being suddenly driven into that area. I know from personal experience in both the public and private security arena, both domestically and internationally, that some individuals feel that they should not be inconvenienced at any cost and believe it is beneath their dignity to subject themselves to security measures. Some Members of Parliament would do well to remember that they are public servants and if those gates had been closed and if PC Palmer had been carrying an automatic weapon, he may still be alive today. The question also arises as to what further carnage would have been unleashed by Masood if the two protection officers had not been waiting nearby for Sir Michael Fallon MP. How much further would Masood have progressed before armed officers were on the scene? Apparently the perimeter of the Parliament buildings is patrolled randomly with no set pattern – so uniformed armed officers may have been some distance away. Unless things have changed dramatically I have, in the past, been astonished at the calibre of uniformed police officers who are deployed within Parliament. On frequent visits to committee rooms, I have observed uniformed police officers who have appeared more like ushers or guides at some stately home than policemen. Most looked very near retirement age; overweight and unfit. They were what was once described within the police service as ‘uniform carriers.’ This does not of course apply to the heroic actions of PC Palmer. As one Member of Parliament stated after observing the lack of security at the Carriage Gates, “One wonders what would have happened if three fit, young terrorists armed with AK47 automatic weapons had stormed through the gates?” Perhaps other MPs should ponder on that one for a while before they object to enhanced security at the Carriage Gates. By the time you receive this Newsletter, double entry gates may have actually been installed at the entrance to New Palace Yard and armed officers may well be manning them. It really is very simple: these types of security gates have been employed in prisons for years and many other high-risk areas. There is a no-man’s area between both sets of gates and only one set of gates is open at any one time. A vehicle enters through the first gate which closes behind – the vehicle and occupants are checked and then the second gates are opened to permit access to accredited persons. Needless to say, the gates would be manned by officers armed not only with handguns but automatic rifles. 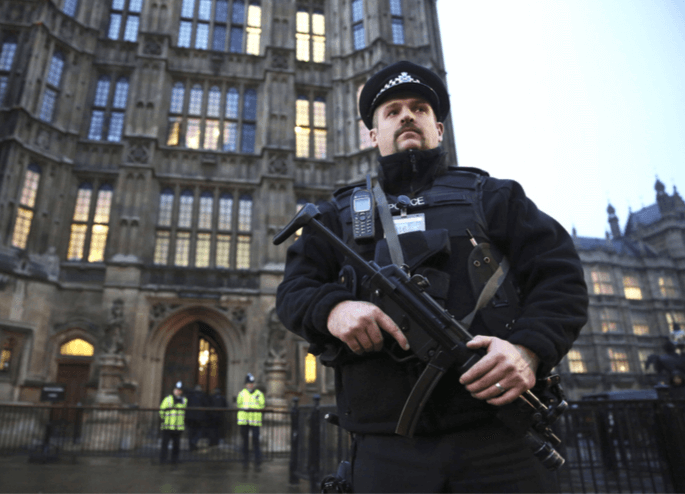 The recently retired Commissioner of Police for the Metropolis, Sir Bernard Hogan-Howe, had, prior to his departure, announced an increase of some 600 additional armed officers within the Metropolitan Police area. As members may recall, I wrote in a previous Club Comment that this desire to place more armed officers on the streets of London has met with a poor response; with few officers applying to be firearms specialists. So much so that it is rumoured that discussions are taking place with the Independent Police Complaints Commission (IPCC) as to how the current procedures for dealing with shootings by armed officers can be changed. Quite rightly, every shooting of an individual by a police officer should be investigated by an authorised independent body. That is currently the IPCC. They oversee and direct all enquiries but do not have the resources to conduct all the relevant enquiries; delegating that to an individual police force’s internal complaints division. In almost all cases, where a person’s have been shot by a police officer, the officer’s concerned are immediately suspended from duty and, in many cases, this suspension has lasted for over 10 months and in some cases, a great deal longer. During this period, the officer has no idea as to whether he may be charged with murder or manslaughter and later face a trial in court. The Metropolitan Police have not stated whether either of the officers has been suspended. The semantics will be interesting as to whether the IPCC treat this as a ‘terrorist incident’ now that the Metropolitan Police have stated that Masood had no connection to any terrorist group. There is no doubt, that this country will continue to face further similar attacks to that perpetrated by Masood and, heaven forbid, even worse atrocities. As is the case where there has been a total abdication by the Ministry of Defence of support for our armed forces when they are engaged in combat and then subject to the likes of lawyers such as Mr Phil Shiner making false accusations, we owe it to police officers, who also place their lives on the line, to give them the necessary authority to shoot terrorists without being hounded through the courts. Failure to do so will undoubtedly see even less officers wishing to be armed and the British public’s safety jeopardised. When President George W Bush said it was “a war on terror”, it was. Not a game of cricket. In Parliament, prior to the tragic events that took place on Westminster Bridge and outside Parliament, the Prime Minister spoke regarding one of the most infamous and evil terrorists in recent years – Mr Martin McGuinness, who died recently. Bill Clinton, who travelled to the terrorists’ funeral, kicked Britain in the stomach and welcomed Sinn Fein into the White House. And the British Government, seeing which way the wind was blowing, wavered in the face of terrorism. My how it wavered. The actions and depravity of McGuinness and his cohorts knew no bounds. In 1974, IRA bomber James McDaid attempted to place a bomb outside a post office in Coventry. The bomb exploded killing McDaid. A funeral procession took place in Coventry on 21st November 1974. The coffin was later that day flown to Ireland. He was hailed a martyr by the IRA. Some hours later (it is believed in “retaliation” for his death), two bombs exploded in Birmingham. Having been present, very soon after the Birmingham Pub bombings on 21st November 1974, when the Tavern in the Town and the Mulberry Bush public houses were destroyed by Provisional IRA bombs and 21 people died and 182 were seriously injured, my personal thoughts go out to all the relatives of the dead and injured who, I am sure, will not in any way be regretting the death of Mr McGuinness. While both McGuinness and Masood were from totally different backgrounds, cultures and religions, they both sought to wreak terror against innocent civilians and members of the security forces. In McGuinness’s case, for over thirty years. What is alarming and makes it more difficult for the intelligence services, particularly in the case of a ‘lone wolf’ attack, is the method. Employed, as in the case of Masood, to inflict death and injuries. What drove him to take the course of action he did? Perhaps we will never know. Nevertheless, it is paramount that the Government afford the police and intelligence agencies every means at their disposal to negate such possible attacks in the future and that security for Parliament is the responsibility of the Metropolitan Police and not internal committees in Westminster. Finally, the funding for the additional security both in physical defences and additional manpower, could come from ceasing to send millions of pounds of taxpayer funded foreign aid to countries ruled by despots who utilise such funds to enhance their own luxurious lifestyle. Perhaps the Government should always remember that they are elected by the people to serve the people and have an absolute primary duty to protect their own population – that is the people of Great Britain and Northern Ireland.